Joined Chamique Holdsclaw, Glory Johnson, Shelia Frost, Tamika Catchings as only Lady Vols to record 1,500 points and 1,000 rebounds. No. 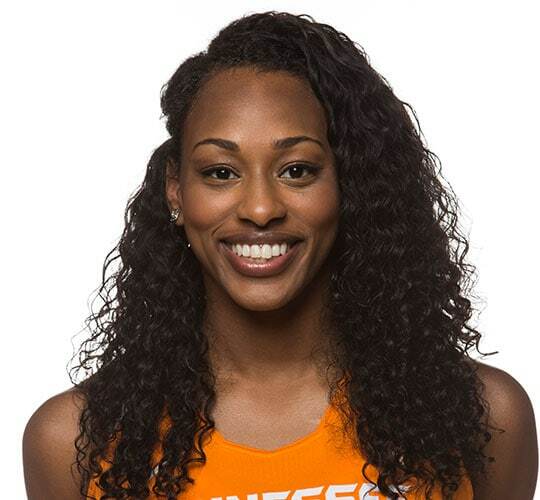 3 all-time on UT’s career rebounds chart behind Holdsclaw and Johnson; No. 9 in career double-doubles (29). 2015-16: All-America Hon. Mention (AP); All-SEC Second Team (AP). Ranked 5th in SEC in rebounds/game. Had career-highs of 19 rebounds vs. Florida, 24 pts vs. Penn St. 2014-15: Ranked 8th in SEC in rebounding average, 3rd in offensive boards. 2013-14: No. 3 in SEC in offensive rebounds; set UT single-game mark with 14 off. boards vs. Ga. Tech. 2012-13: Burst on scene earning All-America Hon. Mention acclaim (WBCA), All-SEC First Team (coaches) & Second Team (AP) honors, and was SEC Newcomer of Year (coaches and AP). Lady Vols’ No. 1 rebounder; No. 2 scorer; had as many double-doubles as UT’s Candace Parker in her frosh year. PREP: Gatorade POY (2012). MISC: Admires Clarksville native and U.S. Olympian Wilma Rudolph.